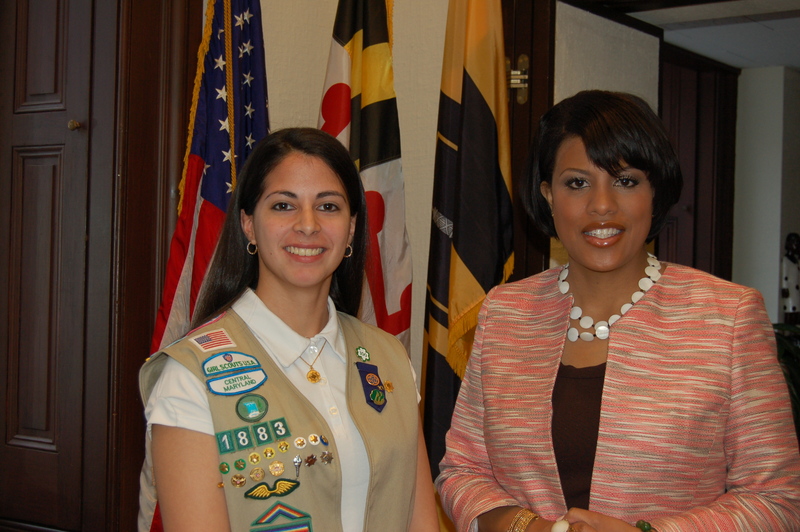 Girl Scout Brianna had the unique opportunity earlier this month to shadow Baltimore Mayor Stephanie Rawlings-Blake as part of the Distinguished Women Shadow Program. Brianna got an inside look at the Mayor’s day attending meetings, public hearings, and more. The Girl Scouts of Central Maryland Distinguished Women Shadow Program connects girls with Maryland women leaders who often become life-long mentors. The Girl Scouts of Central Maryland Distinguished Women Awards Reception and silent auction supports this and other Girl Scout leadership programs. Mayor Rawlings-Blake will be honored with five other Distinguished Women tomorrow, Thursday, April 26, at the Awards Reception at the Baltimore Country Club. Click here to learn more. To attend or to learn more about how you can support Girl Scout leadership programs, contact Maria Darby at mjohnson@gscm.org.